Back in 2015 Spanish indie development studio Relevo Videogames released their debut game onto the PS Vita; a game known as Baboon! and now two years on the game is now being ported over to the PS4 with enhanced visuals, tweaked gameplay and better looking explosions; so today we will be taking a closer look at it in our latest quick look feature. So what exactly is Baboon!? Well it is a colourful, and relatively charming, psyhics based puzzle game that sees you take control of a monkey (known as Tumbili) on an adventure to collect all of the bananas floating in the air and stop the evil pirate monkey from making his plans come to life. Yep; despite being a relatively straight forward game Baboon! comes with its own story, characters and comical conversations in a bid to keep the experience fresh and entertaining – which it does so by the monkey load; and as such this game is a lot deeper than you may initally think. 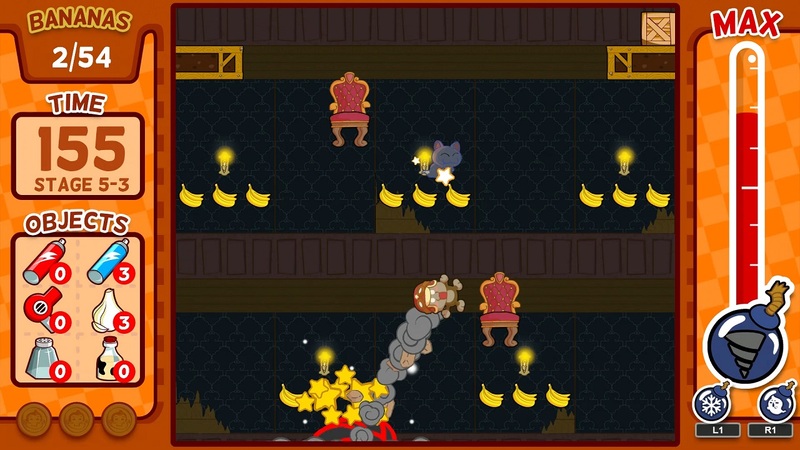 Players progress from level to level through a mini-map, with each mini map featuring a different environments and a different set of characters to interact with – each of which can provide useful information to the player; be it your goal of collecting the bananas or helping you play the game itself. When it comes to playing them game then the objective is to reach to top of the level as soon as possible;but in reality the real objective of each level is to collect the bannas scattered across it and reach the top whilst avoiding any obstacles that are in your way. 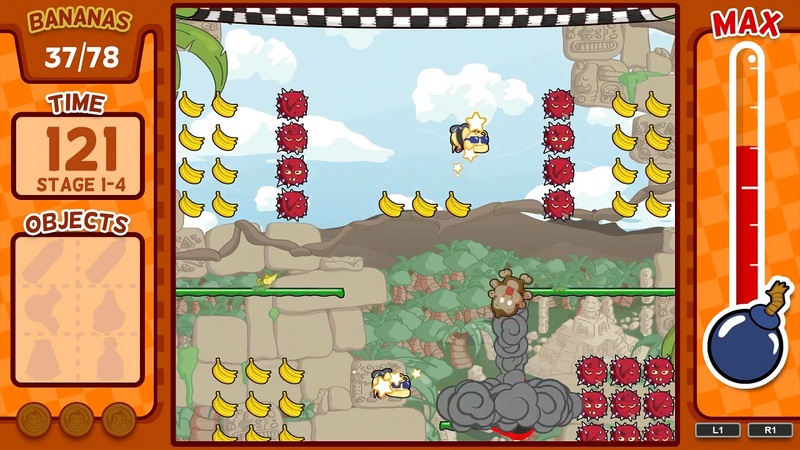 In order to collect these ‘bananas in the sky’ as well as reach the top players must use bombs to explode Tumbili into the air; a feat which is achieved by players placing the bomb in a way that makes him fly into the air at set heights and angles. It sounds much easier than it actually is as you can’t control the size of the explosion – so instead you’ll have to wait until the explosion meter, which appears on the right hand side of the screen, reaches your desired point before setting the bomb off – at which point you’ll see your fury little friend fly across the sky in comical fashion. At first the levels start relatively simple but as you progress things start to get harder with obstacles blocking your path, enemies causing you grief and alternate routes leading to dead-ends. Interestingly these are not the only challenge as each level features a timer, which can sometimes be quite strict, along with individual level challenges – such as completing a level within 20 seconds – in order to unlock more bonuses. 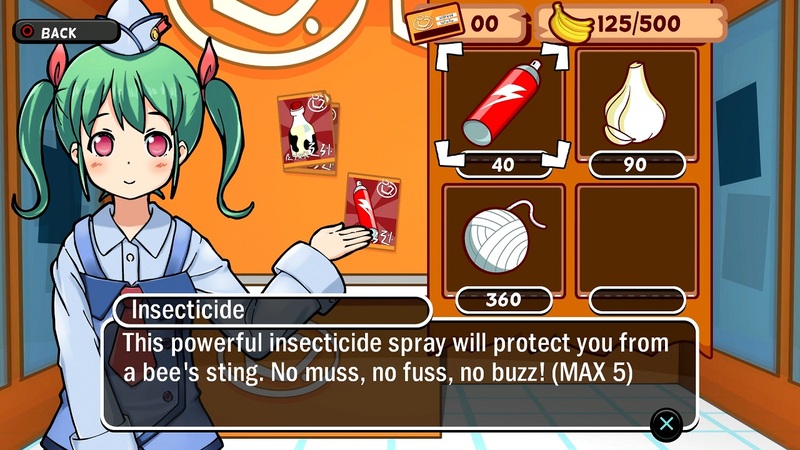 The simple objective is passing every level, the real objective is collecting all the bananas but the challenge is getting all medals unlocked in a single level; fortunately to help you on your way Bananas obtained can be used to purchase upgrades – such as protective helments and bug sprays; at first they may seem useless but eventually you’ll be grateful that they exist -especially when it comes to the boss fights which (after being hit once) results in the entire fight being reset. It can be frustratingly difficult at times; but at the same time it provides that sense of satisifaction once beaten. Baboon! has a lot to offer, and if you’re looking for a different take on the traditional ‘collect them all’ puzzle game, then it’s definately worth checking out; so Let’s Blow-up some Monkey’s and Collect some Banana’s with Baboon! on the PS4 with it’s newly improved visuals and comical charms. Baboon! 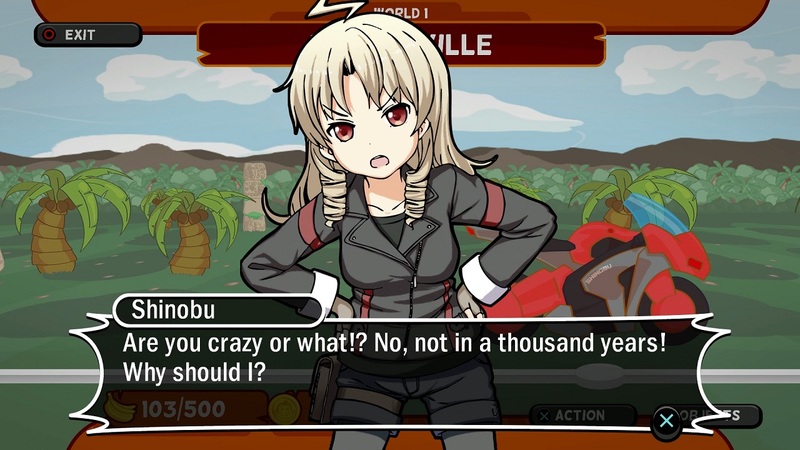 is now available for the PS Vita and PS4 and it is currently priced at £7.99 from the Playstation Network Store.